Perennial herb 30 cm - 1.5 m tall Leaves: opposite, erect, ascending, or sometimes wide-spreading, on short stalks (stalks of main stem leaves 0.4 - 1 cm) with glands in or above the axils. The blades are 5 - 11 cm long, oblong to broadly elliptic or oval, with an abruptly pointed spine-tip, tapered-pointed or rounded base, non-toothed edges, and sometimes with hairs on the underside, though hairless above. Inflorescence: of individually stalked, erect or ascending flowers in terminal, somewhat broad, branched clusters. The inflorescence clusters are typically surpassed in height by the leaves and lateral branches. Flowers: white or greenish white, 2 - 5 mm long, radially symmetric, egg-shaped-cylindric to urn-shaped, and quite fragrant. Sepals: five, but fused at base, then separating into triangular, pointed lobes, which are over half the length of the petal tube. Petals: five, but fused for most of their length, then separating into short, erect lobes, with the petals overall less than two times the length of the sepals. Inside, near the base of the petal tube, and opposite each lobe, is a tooth or scale. Stamens: five, with separate, short filaments attached to the inside of the petal tube, but the lance-triangular-shaped anthers fused together, surrounding and connected to the stigma, and prolonged beyond the stigma into a cone. Pistil: with two, superior ovaries, which are subtended by five nectaries, but the two ovaries sharing a single style and stigma. Fruit: of two, dry, single-chambered, many-seeded, 10 - 20 cm long, elongate, slender, sickle-shaped (with narrowed ends), capsule-like pods (follicles), which open lengthwise by a single seam. Stems: erect or ascending, branched above, and with an obvious main axis. The stems are tough, fibrous, and exude a milky, acrid juice or latex sap when cut or broken. Seeds: numerous, 3.5 - 6 mm long, narrowly elliptic to sickle-shaped, with a conspicuous tuft of 2.5 - 3 cm long hairs (coma) at one end. Similar species: Apocynum cannabinum is incredibly similar to A. sibiricum, but that species has mostly stalkless leaves with broadly rounded to indented bases. Also quite similar is the hybrid of this species and A. androsaemifolium, A. x floribundum, except the hybrid has pale pinkish flowers, stalked leaves, inflorescence clusters that often surpass the foliage, smaller seeds (typically under 4 mm long), and shorter (up to 2 cm long) tufts of hair (coma) on the seeds. The third species in our area, A. androsaemifolium, is the least similar because it has larger flowers (0.6 - 1 cm long) on drooping stalks, the petals are obviously pinkish with spreading or recurved lobes, many of the leaves droop, the inflorescences usually extend beyond the leaves, the seeds are only up to 3 mm long, and the tufts of hair (coma) on the seeds are shorter (up to 2 cm long). Habitat and ecology: Fairly uncommon, often in disturbed sites such as along railroads, in old pastures, and other somewhat open sites. Notes: This species is highly variable in terms of the leaf shape and leaf hairiness. 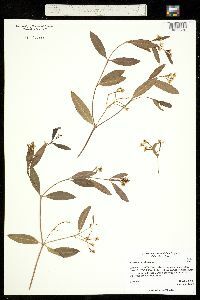 Some taxonomists do not believe that this species and A. sibiricum are separate species, but rather that the latter is only a variety of this, then known as A. cannabinum var. hypericifolium. However, the local floras as well as the most recent treatment of the flora of eastern North America (Gleason and Cronquist 1991) recognize both as separate species, as we do here. Hybridization is very common between this species and A. androsaemifolium. The flowers of our Apocynum species are very fragrant and attract many insects. According to Voss (1996), a particularly striking leaf-beetle, Chrysochus auratus Fabr. is often seen associating with species of Apocynum, and its larvae feed on the roots, thus it has been known commonly as the "dogbane beetle". Several species in the Apocynaceae family are used as sources of chemicals in medicine, or in poisons, and most members of the family are poisonous due to the presence of the milky latex sap. Native Americans were known to use the tough, fibrous stems of Apocynum for material fibers (Voss 1996). Perennial herb 30 - 80 cm tall Leaves: opposite, erect or ascending, essentially stalkless (rarely with stalks up to 3 mm) with glands in or above the axils. The blades are 5 - 11 cm long, 1 - 5.5 cm wide, oblong to broadly elliptic or oval, with an abruptly pointed spine-tip, broadly rounded to indented or clasping base, non-toothed edges, and rarely any hairs. Inflorescence: of individually stalked, erect or ascending flowers in terminal, somewhat broad, branched clusters. The inflorescence clusters are typically surpassed in height by the leaves and lateral branches. Flowers: greenish white or pale yellow, 3 - 5 mm long, radially symmetric, cylindric to urn-shaped, and quite fragrant. Sepals: five, but fused at base, then separating into triangular, pointed lobes, which are over half the length of the petal tube. Petals: five, but fused for most of their length, then separating into short, mostly erect lobes, with the petals overall less than two times the length of the sepals. Inside, near the base of the petal tube, and opposite each lobe, is a tooth or scale. Stamens: five, with separate, short filaments attached to the inside of the petal tube, but the lance-triangular-shaped anthers fused together, surrounding and connected to the stigma, and prolonged beyond the stigma into a cone. Pistil: with two, superior ovaries, which are subtended by five nectaries, but the two ovaries sharing a single style and stigma. Fruit: of two, dry, single-chambered, many-seeded, 4 - 10 cm long, elongate, slender, somewhat straight, spindle-shaped (with narrowed ends), capsule-like pods (follicles), which open lengthwise by a single seam. Stems: erect or ascending, sometimes almost prostrate, often branched above, and usually with an obvious main axis. The always hairless stems are tough, fibrous, and exude a milky, acrid juice or latex sap when cut or broken. Seeds: numerous, 3.3 - 5.5 mm long, narrowly elliptic to sickle-shaped, with a conspicuous tuft of 1 - 2.5 cm long hairs (coma) at one end. Similar species: Apocynum sibiricum is incredibly similar to A. cannabinum, but that species has evidently stalked leaves with tapered or rounded bases, and longer fruit (10 - 20 cm) that are also slightly curved. Also quite similar is the hybrid of this species and A. androsaemifolium, A. x floribundum, except the hybrid has pale pinkish flowers, inflorescence clusters that often surpass the foliage, smaller seeds (under 4 mm long), and stalked leaves. The third species in our area, A. androsaemifolium, is the least similar because it has larger flowers (0.6 - 1 cm long) on drooping stalks, the petals are obviously pinkish with spreading or recurved lobes, many of the stalked leaves droop, the inflorescences usually extend beyond the leaves, and the seeds are only up to 3 mm long. Habitat and ecology: Somewhat common, usually in disturbed sites such as along railroads or in old pastures, but also in other fairly open sites. 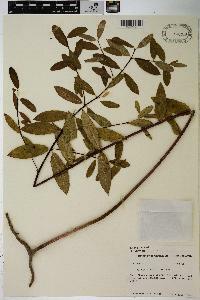 Notes: This species has often been treated as only a variety of A. cannabinum (A. cannabinum var. hypericifolium). However, the local floras as well as the most recent treatment of the flora of eastern North America (Gleason and Cronquist 1991) recognize both as separate species, as we do here. Hybridization is very common between this species and A. androsaemifolium. The flowers of our Apocynum species are very fragrant and attract many insects. According to Voss (1996), a particularly striking leaf-beetle, Chrysochus auratus Fabr. is often seen associating with species of Apocynum, and its larvae feed on the roots, thus it has been known commonly as the "dogbane beetle". Several species in the Apocynaceae family are used as sources of chemicals in medicine, or in poisons, and most members of the family are poisonous due to the presence of the milky latex sap. Native Americans were known to use the tough, fibrous stems of Apocynum for material fibers (Voss 1996). Variety cannabinum grows in moist or dry situations in almost all kinds of soils in all parts of the state. It is usually found in small colonies along roadsides and fences, in hayfields, fallow fields, and open woodland. 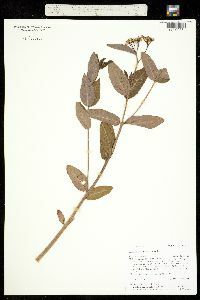 I have found specimens of this and other species of the genus growing in adverse ecological conditions, that have much reduced leaves and a decumbent habit. I refer to such habitats as ballast of railroads, gravel pits, and gravel bars of streams. Habitats and distribution [of variety glaberrimum] similar to those of the species. This variety is more frequent than either the species or the pubescent variety. [Variety pubescens is] found in habitats and places similar to those of the species [A. cannabinum]. Infrequent. A study of our specimens shows several of them to be pubescent on the lower surface of the leaves. Our specimens vary from densely velvety-pubescent to pubescent mostly along the veins with scattered hairs between. Habitat similar to that of the other species [of Apocynum]. Erect, branched above, 0.5-1.5 m, with a well developed main axis; lvs on short but evident petioles 3-10 mm, erect or ascending, 5-11 cm, oblong-lanceolate to oval or broadly elliptic, acute to rounded at the base and mucronate apex, glabrous or hairy beneath; fls erect; cal-lobes usually reaching beyond the middle of the cor-tube; cor cylindric to urceolate, 3-6 mm, white or greenish-white, the lobes erect or slightly divergent; fr (5-)10-15(-20) cm; coma mostly 1-3 cm; 2n=16. Open places; rare or local in e. Can. and N. Engl., abundant from N.Y. to N.D., s. to Fla. and Tex., and w. occasionally to the Pacific. May-Sept. Highly variable in lf-shape and pubescence. Erect to sometimes nearly prostrate; lvs usually glabrous beneath, sessile or on short petioles rarely to 3 mm, the base broadly obtuse to rounded or often subcordate and clasping; infl and cal usually glabrous; cor greenish-white or pale yellow; otherwise as in no. 2. Open places; Nf. to N.J. and W.Va., w. to Man. and Mo., and to the Pacific, more common westward. May-Sept. (A. hypericifolium) Perhaps better treated as A. cannabinum var. hypericifolium A. Gray.